Venture into the deepest darkest jungle in an attempt to come out the other side with life-changing sums of money, by playing the innovative five reel, four row and 100 payline Amazon Wild slot game. One of the most originally and interestingly formatted slots around, Amazon Wild is a game themed around the Amazon rainforest and adds wilds, a bonus game and scatter wins to the equation to make things even more interesting. A highest possible payline jackpot of £100,000 is one of the most generous standard payouts available anywhere. Wild symbols which can expand under certain circumstance to cover an entire reel, improve players’ chances of winning impressively. A nicely themed bonus game helps to break the monotony and make gameplay that bit more original and fun. Payouts on payline combinations below the top jackpot are considerably smaller than that jackpot. The slot’s 100 paylines are all always active, removing one way in which players could alter the amount they bet per spin. Whilst the inclusion of four rows and fully 100 paylines does make Amazon Wild a unique slot, the way in which players can win its top jackpot remains the same. That is by seeing five of the game’s most valuable symbols line up along one of those paylines after a spin. The symbol in question depicts a black panther stalking through the jungle, and pays out at a jackpot worth 10,000 times the pre-set line bet amount. The highest amount that the line bet can be set at is £10, meaning that the jackpot can be worth a maximum of £100,000. 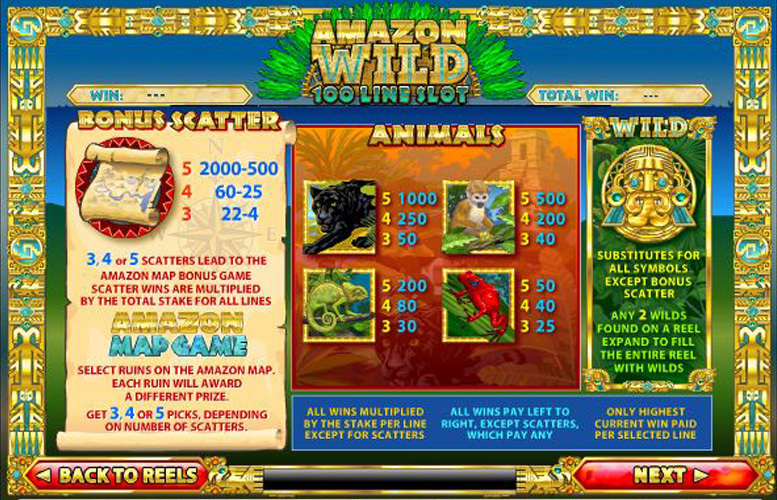 Alongside differentiating itself by introducing a fourth row and featuring an impressive 100 paylines, Amazon Wild’s gameplay also includes wild symbols and a bonus scatter symbol with accompanying bonus game. 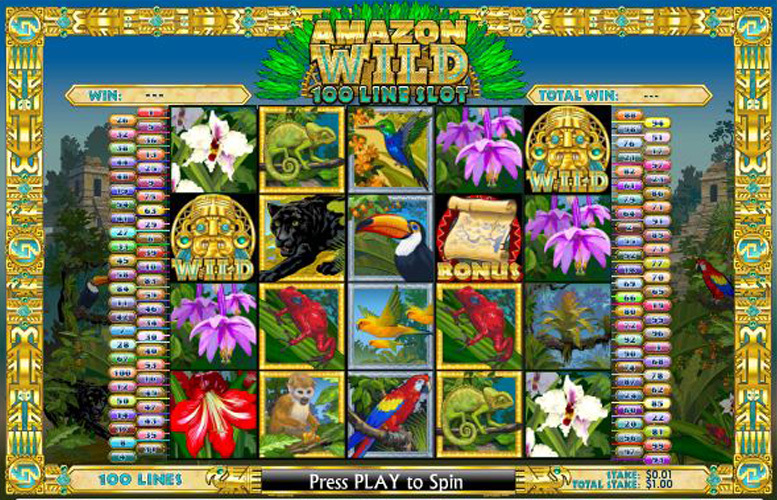 Showing off an image of a golden Inca style mask, the Amazon Wild slot’s wild symbol can appear anywhere on the reels. When it does, it substitutes for any other symbol, apart from the bonus scatter symbol, in order to produce the most valuable possible payline combination. If two wilds appear on the same reel, what’s more, they then expand to cover that entire reel. A symbol with two diverse roles, the Amazon Wild bonus scatter symbol depicts a treasure map on an aged scroll. When three or more of the symbols appear anywhere on the reels, players receive an instant win and are also taken to the slot’s bonus game. In that game they must select different ruins from a map and each ruin selected results in a different prize, too. How many ruins they are allowed to pick, depends upon how many scatters originally appeared to trigger the game. All of the symbols on the Amazon Wild reels show off the flora and fauna of the rainforest, and as we have already mentioned, it is the panther symbol which is the most valuable. Behind that symbol it is two further animals which players will most want to see on the reels, in the shape of the monkey and the big billed bird symbols. Five of the monkey symbols appearing along a payline will result in a jackpot worth 500 times the player’s chosen bet per line. A five big billed bird symbol combination, meanwhile, pays out at a rate of 300 times the line bet. There are a broad range of staking options when it comes to the amount a player wishes to bet per spin through the Amazon Wild slot, but only one way in which to alter their wager. That is by changing the value of their bet per line, given that the slot’s 100 paylines are all always active. The minimum possible line bet that a player can select stands at just 1p and there are then a great many higher value options, all the way up to the maximum possible £10 bet per line. Overall, therefore, what that means is that a player could bet a minimum of £1 per spin or a maximum of £1000 per spin. 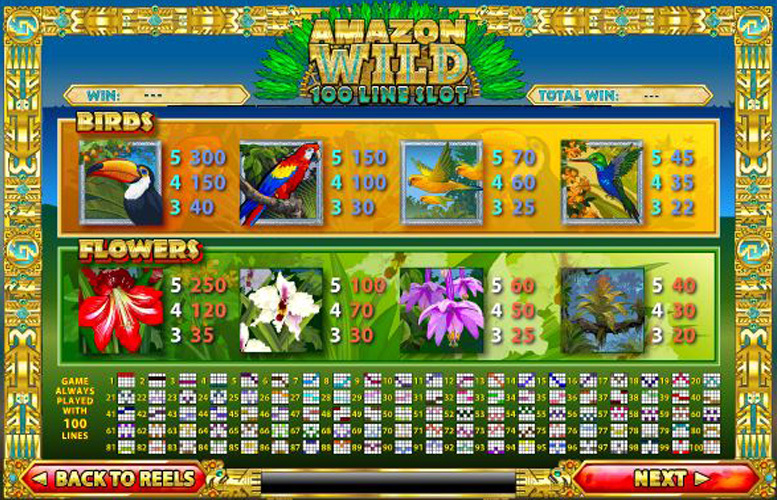 If you’re looking for something slightly different in a slot game option, Amazon Wild may well be the choice for you. With four rows and fully 100 paylines as well as the more traditional five reels, after all, Amazon Wild is one of the more innovatively formatted slots you will find anywhere. What’s more, wilds which sometimes expand and scatters which also trigger a fun bonus game, help to add some extra interest to the slot’s gameplay. It’s not all about fun and games, either, as Amazon Wild boasts a really generous top payline jackpot worth a potential £100,000 to please those players for whom payouts are the most important aspect of any game. What those players may find a little disappointing, however, is that jackpots below the most valuable one do fall away in value significantly. This game has a rating of 4 / 5 with 506 total reviews by the users.